This is possibly the one film with the most potential for propagandizing and emotional manipulation, but United 93 sidesteps the easy way out and gives us a brilliant portrayal of previously unimaginable events that simply tells an uplifting story without the normal movie pitfalls and clichés. 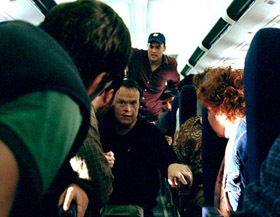 United 93, both written and directed by Paul Greengrass, achieves the perfect tone for a film that follows a 'story' of one day that impacted the collective American public. It begins with the routines of individuals preparing for a day of travel. These individuals include the passengers, the crew and the air traffic controllers, and they are all completely unaware of what is ahead. I must confess that given its factual nature, it is difficult to refer to the people shown as 'characters' because it feels like it somewhat demeans their existence. The use of mostly unknown actors and non-actors portraying themselves allows the story to be told without the distraction of a 'name' performer being the focal point. I recognized only two people in the cast by face and name (Gregg Henry and David Rasche). The plot is rightfully the focus and the emotions displayed by the cast throughout the film were rooted in truth. For example, any profanity had its place as a believable reaction to the circumstances rather than a string of four-letter words that would be at home in Goodfellas. Basically, these are real people shown realistically.